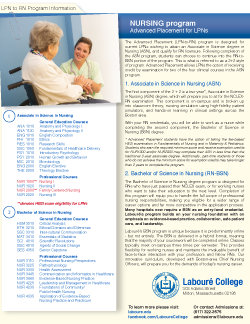 LPNs: Apply for our accelerated RN track! This LPN-RN program is designed for LPNs who would like to qualify for RN licensure. To be eligible for advanced placement, the candidate must complete the application procedure through the Office of Admissions. The applicant must have graduated from another regionally accredited, post-secondary institution, pre-licensure program recognized by the Department of Higher Education and be a program fully approved by the Board of Nursing. Proof of a current, valid Massachusetts license as a Licensed Practical Nurse (LPN) is required. Once a candidate has been accepted to the advanced placement program and paid the deposit fee, he or she has the opportunity to sit for the fee-based HESI examination(s). The HESI will be offered three times a year in fall, spring, and summer. Only one examination may be taken per testing session. Eligible students are sent HESI registration forms and examination preparation information 4-6 weeks prior to the examination. The cost of each exam is $79.00 by check or money order made payable to Labouré College. The HESI examinations are computerized and scores are given immediately upon completion. A minimum score of 780 on the examinations is necessary for exemption credit to be earned. Please contact the Office of Admission for details on HESI examinations available. There will be no opportunity for re-tests. Placement into any nursing course is on a space-available basis. Advanced placement students are encouraged to attend a nursing orientation before beginning nursing courses. Please visit the nursing program overview page for information on curriculum, course descriptions, clinical placement, and career information.